Sigrity Transistor-to-Behavioral Model Conversion (T2B™) converts IBIS models from transistor to behavioral, enabling accurate and efficient power-aware bus simulations in hours instead of the days it would take with transistor-level models. Sigrity XcitePI™ Extraction for chip-level extraction of signal power and ground interconnect from the I/O to the bump with header information enabling push button connectivity to the extracted package model. Sigrity XtractIM™ technology and 3D-EM technology work together to create a complete package model regardless of package type, for coupled signal, power, and ground interconnect models. Also included is package assessment, bridging the gap between the package designer and package characterization engineer. Sigrity PowerSI™ technology extracts coupled signal, power, and ground from PCBs. 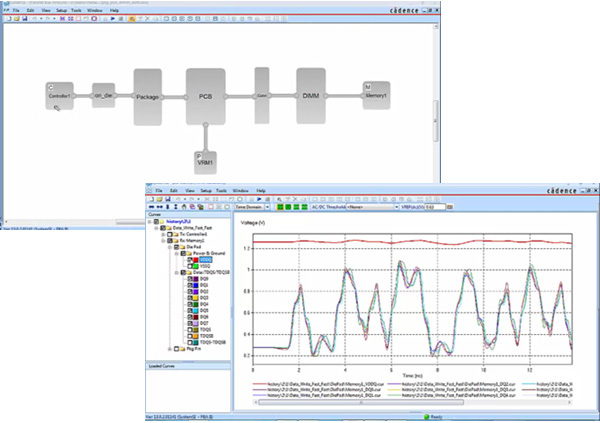 Included in the extracted model is header information enabling push-button connectivity to the extracted package model(s) and/or connector model(s). Sigrity SystemSI™ technology provides easy connectivity of power-aware IBIS models and power-aware interconnect models. Simulation results exhaustively determine worst-case conditions and compares those results to JEDEC compliance requirements, allowing you to sign off your DDR4 interface including BER requirements. Why Does Signal Integrity Analysis Need to be Power Aware? Why Does Signal Integrity Need to Be Power Aware?